Display arranged for by David Tipton. 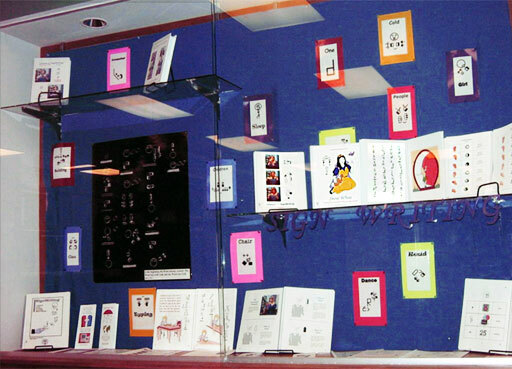 Display designed and implemented by Sara Smith. I started this project for our library. I have been following SignWriting (and DanceWriting) for years. I remember the original program for SignWriting. While I am not deaf, I have had a fascination with sign language all of my life. You may be interested to know that our library is part of a library consortium in Ohio called OhioLINK. It is a consortium of all the major academic libraries (including Oberlin College and the Ohio state schools). I noticed that there were only a couple of SignWriting items in the entire consortium. That is why I decided we needed to have better representation of this fascinating linguistic tool.